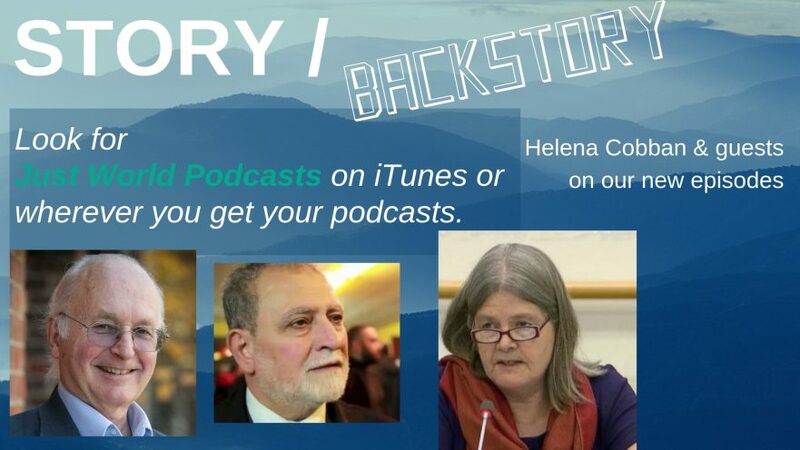 In the second half of each of the two latest episodes of the “Story/Backstory” podcast, Just World Ed president Helena Cobban presented a conversation with an invited guest. In Episode 3, “The two-state solution is dead”, her guest was the much-respected expert on (and practicioner of) US Middle East policy, Dr. William B. Quandt (shown at left above.) In Episode 4, “Gaza the crucible”, which was released today, her guest was the British-Palestinian author and activist Dr. Azzam Tamimi. You can access any of the four episodes in this new podcast series from the homepage for Just World Podcasts. Better yet, if you want to learn about, and access, each episode as it is released, you can subscribe to “Just World Podcasts” on iTunes or wherever you get your podcasts from. We would hugely appreciate it if, after accessing the podcast series on iTunes or elsewhere you could leave a review, as this will boost the ratings and make this timely content more visible to other users.